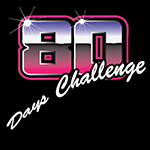 I've entitled it the "80's days challenge". We'll see how it goes - and I'll post up anything I do that I think may be of interest here. I won't know until I decide what I feel like doing at the time. I'm also making this a more open medium approach rather then lock myself down into a single artistic technique or style, so it could be anything from a simple scribbled drawing on a piece of paper, a 2D vector illustration, even developing cool 80's downloadable computer games. Subjects, creative styles and mediums - its all about keeping to the theme. Some of my favorite things flowed in from the 70's - TV shows, comic books, etc. I see this 100 day challenge as being more about those things that were popular in the 80's, not just coming into existence in the 80's. It opens up a lot of opportunities to look back on those nostalgic moments throughout my 80's childhood.